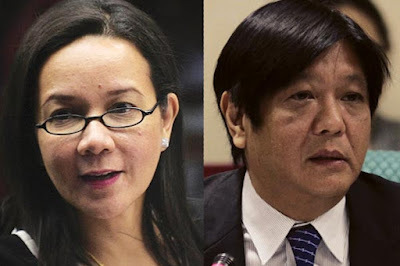 Thinking Pinoy: POE-blematic Scenarios: Another President Ferdinand Marcos? POE-blematic Scenarios: Another President Ferdinand Marcos? With Grace Poe's DQ issue, there can be three Philippine presidents in one year. Yes, you heard me right. Everybody knows about the disqualification cases filed that Senator and presidential candidate Grace Llamanzares-Poe is facing in the Supreme Court right now. Filed by Atty. 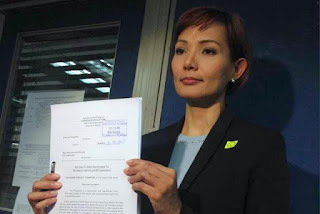 Estrella Elamparo, the case appears to be a simple and straightforward process of finding out whether she’s eligible to become the Philippine president or not. However, as the issue drags on in the Supreme Court, the “POE-blem” becomes even more “POE-blematic”. Poe hinted that the Liberal Party’s Mar Roxas and UNA’s Jejomar Binay are behind this POE-blem. However, now that the issue is full-blown, the motives behind it have become irrelevant. That is, let’s deal with the possible consequences of this landmark case and how it will affect the events after election day. Thinking Pinoy (TP) consulted with a lawyer who happens to work for one of the firms that handle the case. TP decided against revealing the source’s identity for her own protection. I will need his/her legal opinions in the future so/and I don’t want him/her to lose his/her job. SC writes then releases decision. Losing party files a motion for reconsideration (MR). SC hears arguments regarding MR. The process seems simple enough: the time frame is the problem. SC takes its time to write decisions. While TP hopes that SC settles this issue as soon as possible, this entire process takes considerable time. Despite this, we can expect the decision to come out before April ends, so let’s just assume that. But that’s not it. The decision on April, which the COMELEC may consider executory, is not final. 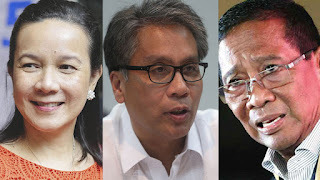 The losing party – Poe or Elamparao – will inevitably file a motion for reconsideration which, in some SC cases, can take the SC another three or so months to decide upon. Grace Poe is among the top candidates, if not the top candidate, in recent surveys. The new president is sworn in on June 30th. Now, let’s evaluate the possibilities/scenarios in light of the current campaign landscape. The first scenario is not extraordinary so we will not examine them in detail. It’s basic: Poe is qualified, she becomes presidents if she wins the elections. Period. SC decides anti-Poe, Poe files MR.
Poe wins elections but COMELEC declares 1st runner-up as winner. Poe wins MR before June 30. Because the initial decision disqualifies Poe, COMELEC will still count votes for Poe, even if these votes are invalid. If she wins, COMELEC will declare the 1st runner-up as winner. However, if she wins the MR, COMELEC will retract their original declaration and we will have a President Grace Poe. SC decides pro-Poe, Elamparo files MR.
Elamparo wins MR before June 30. This is similar to Scenario 2 except that this time, Poe is declared the winner but she eventually gets replaced by the 1st runner-up before the oath taking. This will be embarrassing on Poe’s part, and a cliffhanger scenario for supporters of the 1st runner-up. So this time, the 1st runner-up becomes the president. Poe wins MR after 12 Noon of June 30. This is where things become really messy. Because the initial decision disqualifies Poe, COMELEC will still count votes for Poe, even if invalid. If she wins, COMELEC will declare the 1st runner-up as winner. The 1st Runner will be sworn in as president on June 30 as mandated by the constitution. However, she wins the MR after that, so the new sitting president will have to step down and Poe takes over. That is, we get to have three presidents in one year: Aquino then the 1st runner-up then Poe. Regardless, it’s another scenario where we have a President Grace Poe. Elamparo wins MR after June 30. It can get even messier, with the new vice-president coming into the fray. In this scenario, we get a President Grace Poe on June 30. She subsequently gets removed from office afterwards. In Arnado vs COMELEC, a similar case, the mayoralty of Kauswagan, Lanao del Norte was given to Florante Capitan, the 1st runner-up. Now, there is a difference between mayoralties and presidencies. Unlike mayoralties, the rules of succession/replacement concerning presidents is defined in the constitution itself. The key word here is “qualify”. If the initial decision is pro-Poe but an MR is still pending and the SC issued a temporary restraining order (TRO) on the COMELEC’s proclamation, the Vice President will become acting President. 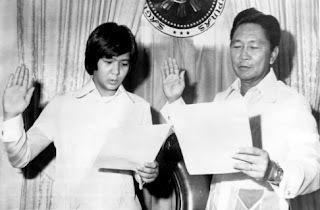 Because Bongbong is leading in the surveys, there’s a possibility that we will have a second President Ferdinand Marcos, albeit briefly. Now, if Elamparo wins the MR, the COMELEC will declare the 1st runner-up president, and we can move on with our lives. But what if a TRO is not issued? After all, even if TROs against the proclamation of other lower positions have been issued in the past, we are talking about the presidency here. That is, what if there’s no TRO and Grace Poe is sworn in on June 30th? Arnado vs COMELEC comes in, where the COMELEC disqualified Arnado and proclaimed the 1st runner-up as mayor of Kauswagan, Lanao del Norte. Ideally, Bongbong becomes acting president and the 1st runner-up takes over as president after Elamparo wins the MR. However, just like a broken record, there’s another complicating factor. If Poe is considered disqualified, then the 1st runner-up takes over. If Poe is considered removed, then we have a President Ferdinand Marcos II. Like this, except that this time, it's the guy on the left. But wait, there’s more! We’re already at this point so TP might as well go for it. If you thought the previous scenarios are extreme as they are, wait ‘till you see the next ones. Poe wins elections but 1st runner-up is declared winner. Poe files MR, MR is denied. 1st runner-up is sworn in as president. A few days later, Poe files a second MR.
SC grants motion, reverses anti-Poe decision. The first five events look simple enough so I won’t explain them anymore. What we need to discuss are the last two. A second motion for reconsideration is forbidden except for extraordinarily persuasive reasons, and only upon express leave first obtained. What if her biological parents suddenly pop up from nowhere? What if incontrovertible DNA evidence becomes available? What if she decided (and succeeds) to prove that she’s Bongbong’s sister? Then here, my friends, is what we call a constitutional crisis. Note: This article was based on a casual conversation with a lawyer-friend. It should not be taken as legal advice. If you feel that any particular argument in this article is invalid, feel free to point them out. The purpose behind this article is the sincere exploration of all legal possibilities concerning Poe’s case. TP’s curiosity is solely to blame.